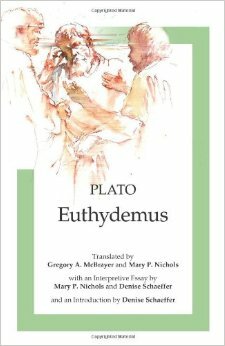 In preparation for Stoic Camp New York 2015 I have been reading one of Plato’s dialogues, the Euthydemus. My co-organizer, Greg Lopez, and I picked it because it is crucial to understand the Stoic concept of wisdom. The version I have is published by Focus, with an introduction by Denise Schaeffer, translation by Gregory McBrayer and Mary Nichols, and a nice and very informative accompanying essay by Nichols and Schaeffer. It’s a bit of a weird dialogue, and it was neglected by scholars until recently. It features Socrates (of course), engaging two Sophists — Euthydemus, and his brother Dionysodorus — who sound for all the world like the caricatures of a pair of modern academic postmodernists. The strange thing, though, is that it isn’t clear the extent to which Socrates himself takes these two characters seriously, even at some point professing admiration for them and their ways, as opposed to displaying his sarcasm at its best (I tend to lean toward the latter interpretation). The other unusual thing in the dialogue is that we don’t get to hear it directly, as it is normally the case with Plato. Rather, we are presented with Socrates’ recounting of the conversation to his friend Crito, who incidentally has his very own Platonic dialogue dedicated to his name. One of the crucial points of the dialogue (279-282) is Socrates’ exhortation of wisdom, where he explains that wisdom is all that matters because wise people do well and prosper in anything they do. Happiness, he claims, doesn’t derive from having goods, or knowledge, but from using those things wisely. Socrates goes even so far as to suggest that if one is not wise one is better off without goods or knowledge, because he would risk using them unwisely, which is worse than not having them at all. However, Socrates then qualifies his position (282) by saying that it makes sense to seek wisdom from others only if wisdom is something that can indeed be taught. But of course we know from a number of other Platonic dialogues that Socrates very much thinks wisdom can be taught, otherwise his entire enterprise of philosophizing by engaging other people would be fundamentally pointless. At 288-293 Socrates resumes his exploration of wisdom, claiming that what is necessary is a special kind of knowledge, “in which making and knowing how to use what is made coincide” (289b), unlike, say, knowledge of making a musical instrument, which is not necessarily accompanied by knowledge of how to play it. Wisdom is precisely this combination of knowing how to make and knowing how to use. But making and knowing what? Socrates examines a number of candidate answers, rejecting them. For instance, wisdom is not knowledge of how to make speeches, since some speech writers don’t know how to use what they write, and some orators don’t know how to write their own speeches. The same goes for generalship, or the art of politics. Sprague, one of the commentators of the Euthydemus cited by Nichols and Schaeffer, claims that at this point the discussion has moved to the level of a “second-order art,” a type of knowledge that brings happiness (in the sense of eudaimonia) “not by teaching . . . any particular skill, but by imparting an intellectual and moral quality.” Wisdom, that is, is a type of moral knowledge. One of the intriguing aspects of the Euthydemus is the distinction it makes between sophistry and philosophy (though the details of how this actually comes through in the dialogue itself are still being debated among scholars). In some respects, it looks at some points during the dialogue like Socrates isn’t that different from the two brothers: they are all playing games with words, if you like. But the crucial distinction comes out when Socrates asks Dionysodorus whether he really believes what he is saying (which at several points sounds absurd, as when the brothers argue that everybody knows everything) or whether he says it “for the sake of argument” (286). Dionysodorus simply refuses to acknowledge the distinction between the two scenarios, something that Socrates himself would never do. Philosophy, then, is more than just playing with words. It is a self-reflective activity where one is engaged in a (admittedly never ending) quest for wisdom, because, as Socrates’ friend Crito, reminds us (288), we ought to pursue wisdom as it is good for us, since it is the sort of “second-order art” that teaches us how to live the eudaimonic life. This entry was posted in Ancient Stoicism, Virtue Ethics on August 20, 2015 by Massimo. I have seen the argument that courage is the strength to live a virtuous life. The Euthydemus dialogue is a little like reading comments on Scientia Salon where we have the same delighting in eristic wrangling(from certain well known commenters!). Faced with the cynical eristic arguments should we react as Socrates did? It exacts a price in time and patience. Or should we react as Ctesippus did when he said “You say amazing things, O men from Thurii, or Chios,…Talking nonsense doesn’t bother you at all“. Here I seem to hear Aravis’ exasperated voice. How little has changed in more than 2000 years. We seem to be replaying this all over again on the Internet. This would have been a good basis for an essay in Scientia Salon. I thought this story was an exercise in moral courage, to persevere and to value careful thought in the face of mockery. hi Massimo, I appreciate your statement: “even virtues … are good only insofar one is virtuous, and can therefore deploy them properly.” So that means virtues are inherently morally good. I like the idea that all the virtues are really just Wisdom, too. I also like Socrates’ shift away from the greatest good being happiness. One question: I have moved on from trying to resolve determinism right now–sigh of relief–but onto “human nature.” I am re-reading Pat Churchland’s work, which I enjoy, and helps me understand my own perspective. I also re-listened to her Rationally Speaking interview. She mentions Hume quite a lot (and I know you love him). Is there some of Hume’s writing on the topic–this one or any other– that you might recommend to a fellow naturalistic Stoic? I believe this is very close to how Zhuangzi conceptualizes virtue. One with utmost virtue would have the capacity to respond to circumstance without coercion and in accord to nature. Circumstance would be the interaction between ever changing resources and affordances each of which can be classified into internal & external, although for Zhuangzi in virtuous action the internal external demarcation would dissolve. I’ve always been a bit confused by the virtues: if there is just one true Virtue (wisdom or living in accordance with nature/reason) why then distinguish three others, seemingly placed on an equal footing? Seems a bit arbitrary and confusing…? That might be because wisdom is like the air traffic control of the mind. It marshalls, coordinates, directs and controls all other rational faculties of the mind. Seen in this way all other virtues are subordinate to the virtue of wisdom. from SEP – Hume’s Moral Philosophy. Catholics will additionally stress the importance of the theological virtues, faith, hope and charity. It takes wisdom to make sense of the many virtues and find the right balance in applying the virtues to the way one lives. For example, in Roman times the virtues of honour, courage, discipline, determination and loyalty dominated all other considerations. Was that a wise balance? Today we do not think so though one might argue that it was appropriate for their times..
Mark, an interesting example of the role of wisdom in marshalling the virtues is to consider what constitutes virtuous behaviour when acting as a member of a committee. As a committee member one has fiduciary duties to one’s constituency and collegial duties to fellow committee members. Vigorously exercising one’s fiduciary duties can conflict with one’s collegial duties while conversely, being unduly deferential to one’s colleagues on the committee may compromise one’s fiduciary duties. The primary duty of a committee member is to discharge his fiduciary obligations to the membership of his constituency. This is the legal obligation of one party to act in the best interest of another when he has been entrusted to act on its behalf. When someone becomes a member of the committee he automatically assumes this legal obligation to the membership of his constituency. He is required to perform his duties in the best interests of the constituency and to avoid conflicts of interest with other, external bodies. In other words, he is required to be loyal to his constituency. He is required to exercise due care and diligence in the performance of his duties. His actions must remain faithful to the intentions and mission of the parent body. The duty of good faith. He has a duty to discharge his obligations with sincerity, honesty and fairness, avoiding all deception, malice and hidden motives. The committee member also has a duty to work harmoniously with his fellow committee members in their discharge of their fiduciary obligation to the membership of the parent body. Respect. Show respect by refraining from attacks or hurtful behaviour and show respect for differing viewpoints. Courtesy. Be polite and be sensitive to the needs of fellow committee members. Cooperation. Cooperate with requests for help, information and assistance. Collaboration. Work together in the performance of tasks, where required. Confidentiality. Keep the precise details of deliberations confidential while communicating the results of the deliberations. This is necessary to allow people the possibility of expressing themselves freely without recriminations or embarrassment. Revealing the precise details of deliberations can have a chilling effect on internal discussion. In this situation wisdom is to properly understand the virtues required for the role of a committee member and to know how to balance one’s fiducial duties with one’s collegial duties, which may sometimes be in conflict. Thanks Labnut for your detailed responses. I understand the idea that wisdom coordinates the other virtues but then I think it is confusing to list wisdom among these other virtues. For instance the Wikipedia entry on stoicism lists the “four cardinal virtues of the Stoic philosophy” as wisdom (Sophia), courage (Andreia), justice (Dikaiosyne) and temperance (Sophrosyne). The SEP entry says “the Stoics equate virtue with wisdom” but then later on it gives the “characteristic excellences or virtues … [as] prudence or wisdom, justice, courage and moderation, and other related qualities.” Here wisdom just seems to be one of many virtues. Socrates does not teach wisdom. He describes his art as being like that of a midwife. So saying Socrates can teach wisdom is like saying the midwife gives birth to the baby. Socrates helps or facilitates wisdom but cannot transmit it like he could transmit the art of a stonemason.